Peter Powell: "Hi folks! 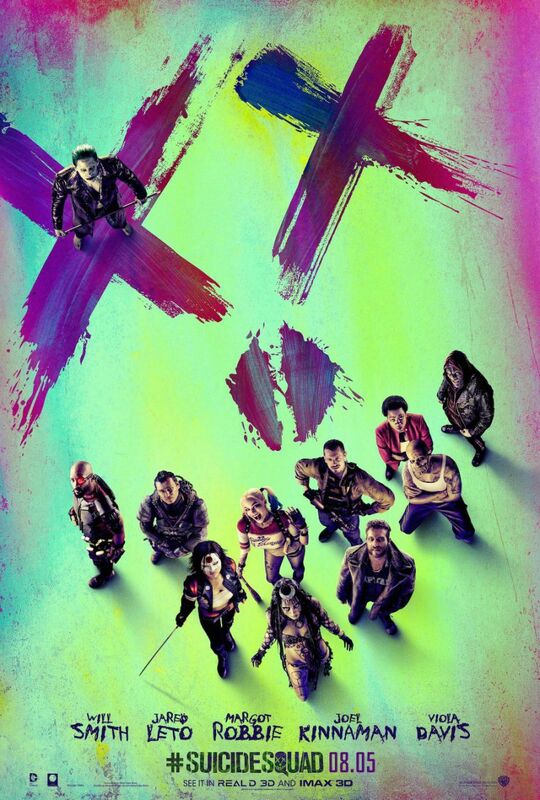 Welcome to the party! There is a Caribbean atmosphere and nine live acts for you to enjoy.! This is Top of the Pops and everybody salsa with Modern Romance!" Modern Romance: Everybody Salsa . The studio is insane this week. It's as if Michael Hurll looked at the Japanese/Latin themed Conga line that ended last week's show and challenged himself to go further. Legs & Co are dressed as playing cards. Two people are running around dressed as jesters -or could they be Jokers for the card set? Streamers are being waved. And there is a baffling selection of hats; fez; shiny party hats; crowns; and some bloke at the back wearing a white chef's hat. John Foxx: Europe (After The Rain) . Europe After The Rain features a piano so Designer John Coles has planned the stage with a right classy look; big white grand piano, some greenery, and classical busts. Shepherds Bush as Athens reborn. Alas, the grand piano is too massive to fit on the stage and has to be left at the awkwardly on the floor at the front where the audience keep leaning on it like philistines. Also, where's John Foxx's drummer gone? (John- Maybe he’s inside the piano? )Unless that statue is playing them? "Help! I'm in the piano! Anybody?!" British Home Stores closes for good this week leaving another gap in the increasingly slim choice of large UK stores. Not a shop I personally used but one which employed thousands of people and whose large city centre footprint will be difficult to fill. 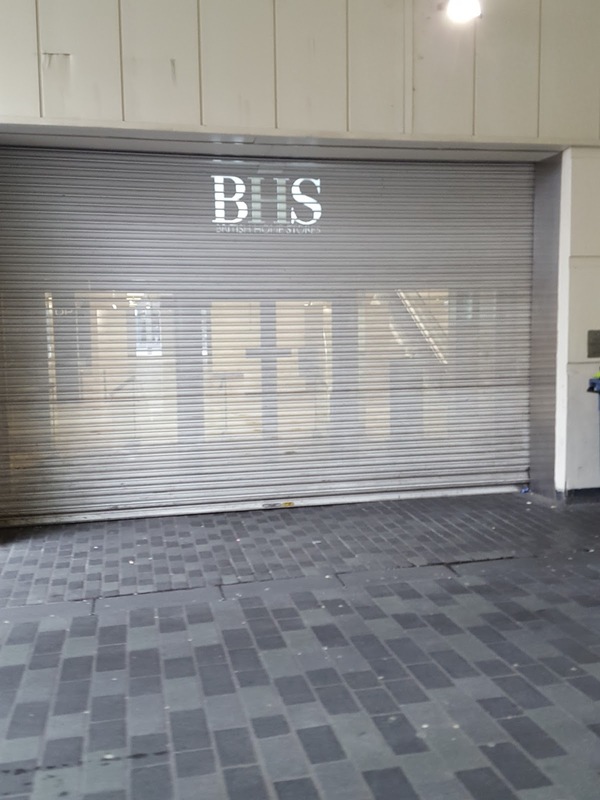 I suppose some of the space will soon be occupied by Costa Nero Republic or student flats but it is another example of a big name being downed by the triple whammy of high rates, Primark and online shopping. 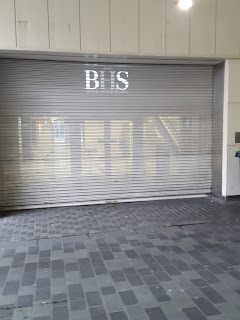 BHS was of course a struggling company but more intriguing- and perhaps more prescient- is the decision by Burtons and Dorothy Perkins to abandon many of their larger stores for a mainly online presence. Is this a glimpse of our retail future and if so, what will they do with all those empty shop units? Not that cities are stopping building them. No development is complete these days without a row of shop units in it even though the range of shops is falling year on year. How many coffee shops is too many? A few weeks ago I was intrigued by a hefty old queue snaking from the entrance to our city centre Waterstones all the way down the side of the shop and into the next street where it curved around the front of several other shops. In fact there were so many people in this queue that it had actually been split into two with the second part starting in the middle of the pedestrianised walkway a short distance away. All of the queuees were young and mostly female so I assumed that the latest pop sensations were in town. As I wandered to the head of the queue to find out what megastar was in attendance I spotted the book that was the cause of this lunchtime commotion. Turned out it was the new title from vlogger Tanya Burr entitled `Tanya Bakes` in which she does just that. 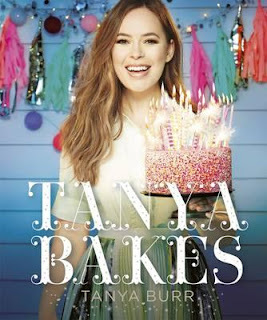 So a book about baking written by a vlogger attracted a crowd this big? Not even Dame Mary Berry would surely command such an army of admirers? Not for the first time it alerted me to the way both media and celebrity have changed. Increasingly where once pop, tv and sports stars were the pin ups of the young, nowadays it is just as likely to be an online star. However these online stars are now migrating like birds seeking warmer climes into traditional media. 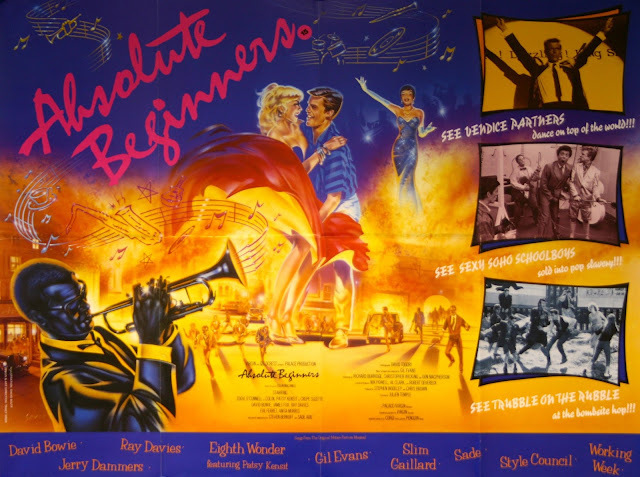 The Eighties and it's music faithfully recreated in John Carney's delightful latest film. It’s good to know that there are still smaller more personal films that are not depressing or cheap horror still being made and Sing Street, just released to buy, is a little gem. Telling that age old but still engaging coming of age story it is also suffused with the 1980s in which it is set. It’s odd to consider that such an era is now `historical drama` because I remember it well! As it seems does director/ writer John Carney (who also brought us Once) because he has assembled a movie that mirrors the moves of many an Eighties teen film yet relocated the narrative to a Dublin that is a long way removed from the middle class settings of Pretty in Pink and company. It works a treat and as a bonus you also get a clutch of sings cheekily inspired by period hits yet still sounding fresh. 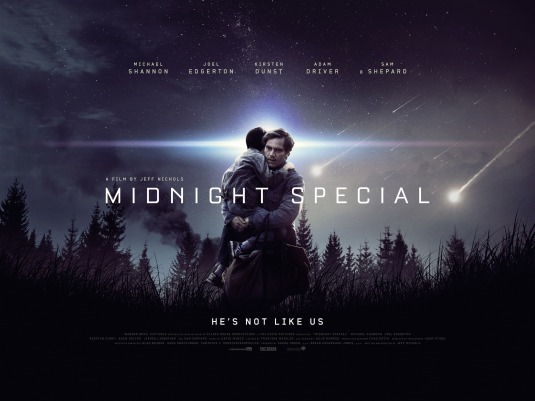 There is something holding Midnight Special back from fully realising its potential. An enigmatic sci-fi slowburn with some superbly visual moments and a streak of realism ingrained in even the most unexpected development Jeff Nichols' film draws particularly from two classic sci-fi movies. Yet lacking the warmth of ET or the sheer sense of wonder that Close Encounters of the Third Kind evokes it just doesn’t reach the same level. 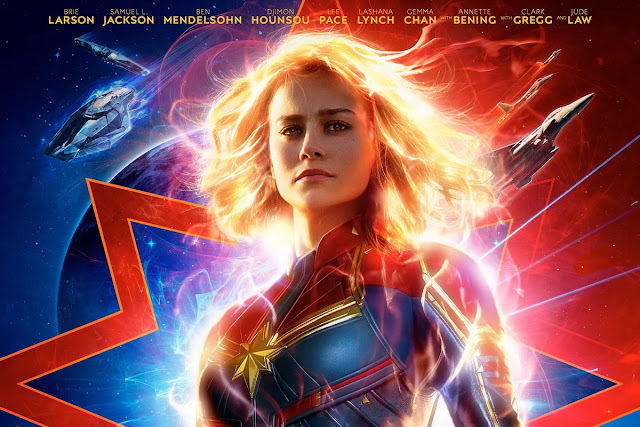 Part of that may be because of the times; would we now be so entranced by a film that is not about alien invaders or battles but simply a survival story? Perhaps to compensate for modern day cynicism the presentation is mostly grim and hard edged occasionally interrupted by flashes of special effects. The plot is straightforward in an age when we perhaps expect surprises and spoilers. To say that there are really none makes the film sound dull, which is isn’t, but by the time of the big visual reveal the viewer may well have settled too far into the everyday to accept such a sight. Anarchic gang add much needed colour to the DC movie Universe. Julien Temple’s notorious film is thirty years old! It’s amazing to think three decades have passed since Absolute Beginners was first released yet I’d never seen it till now. This despite the soaring title song being one of my favourite David Bowie singles. My knowledge of the film has been wholly rooted in the promo video for that Bowie single to the point where I was half expecting the man himself to be wandering around London at night as proceedings open. More than that though the way the video is edited suggested a look that, obviously, is different when it comes to watching the film itself. Then there’s the bad reputation Julian Temple’s movie had had over those decades being panned and flopping having cost over £8m to make and earning only £1.8m. It’s reputation sank so low that it’s been unavailable to buy for years. Now though it is back in a 30th anniversary edition so time for me to reconcile those fleeting clips slotted into Bowie’s promo with the full film itself. Will I absolutely love it or will I lay down the hard lines? 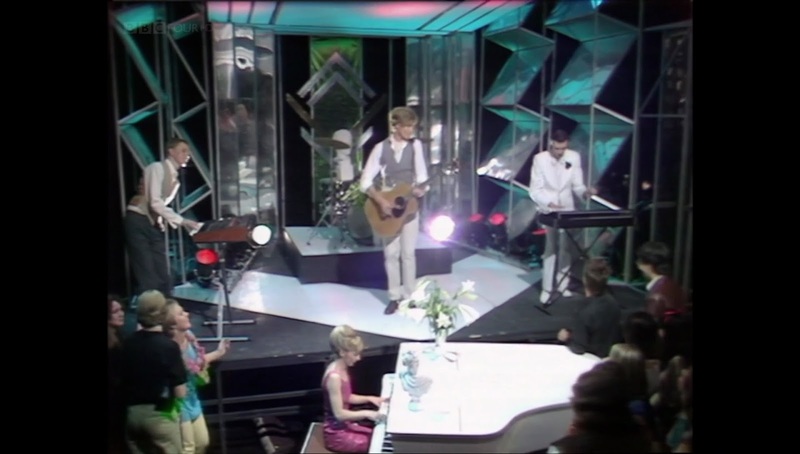 Simon Bates: "Welcome to the summer and the Top of the Pops on a Thursday, with Duran Duran and Girls On Film at number six, over there." 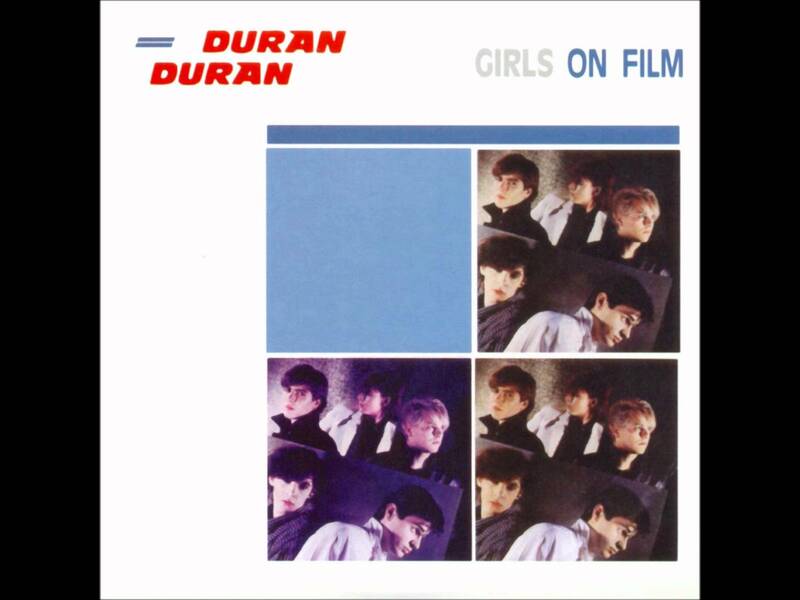 Duran Duran: Girls On Film . Wait a minute! Duran Duran started Top of the Pops with this song last time. Oh, BBC4 has skipped a week because of J*mmy S*v*l*. It's unfortunate that two back to back shows should have such similar line ups (*spoiler 5 songs out of the 10 this week also featured on the last BBC4 edition*). Still, it could be worse the skipped show featured Gidea Park with their "song" Beach Boy Gold followed by Tight Fit "performing" Back To The 60s. Two diabolical song medleys one after the other; the survivors must have envied the dead. Last "week" (note to self, don't do "that" again) I rightly criticised Duran Duran for being boring and competent. Luckily this week Simon Le Bon is wearing a hideous stripped shirt and headband combination, and he's skipping round the stage like a tiny child. Oh, and check out the Duran Duran caption at the end of the performance. It's massive. They've taken a regular caption and blown it up to occupy the whole screen. I don't think we've seen that before.